While I was finishing up some practice questions tonight, J put together one of this week’s recipes. Preheat oven to 400F. Line a baking pan with aluminum foil. Spray with cooking spray. Place fillets skin side down on the foil. Drizzle olive oil over the top of the salmon. Sprinkle with salt and pepper. Cook for 10 minutes. Cut the mango and avocado into 1/2″ cubes. Mix them with the onion and pepper. Squeeze limes over the mixture and gently mix. Heat 1 TBSP olive oil in a skillet over medium heat. Add asparagus and cook until bright green (they will still have some crunch then). Sprinkle with salt and pepper, if needed. All in all, it was pretty good. The salsa wasn’t spicy at all, so we would use a hot pepper next time. I think the salmon would be even better if it were marinated in lime juice and hot peppers, and then grilled. You could also do this to the asparagus to add a little something special to it; I have never had lime on asparagus, but lemon is quite good. If you try it, let me know how it turns out! We had some frozen salmon left over that I really wanted to use up. I knew we would need easy-to-transport fruits for camping, so oranges seemed like the perfect pair with the salmon. I made a salsa (or chutney…I am not sure which this would be, if it is even either of these) the morning before we made the salmon. It was extremely hot outside, so I decided to just cook the salmon in a skillet instead of grilling it. In hindsight I think this was best – freezing the salmon dries it out and grilling is a dry cooking method, so by cooking it in a little oil and its own juices probably helped keep the salmon from tasting like jerky. 1. To prepare the salsa, peel 3 oranges and section them from their skins. To do this, cut the orange in half horizontally, so it looks like a halved grapefruit, Begin cutting the wedges out. By using the knife, you will cut the skin and the slice should peel apart from the skin. The flesh should look more like a Mandarin orange at this point. If not, it is okay to just use the whole orange. Add in the onions and peppers. With the 4th orange, use a grate and grate about 1 tbsp orange zest from the rind. Cut the orange in half and squeeze the juice from each half into the vegetable and fruit mixture. Add the Caribbean jerk and garlic. Mix well and let stand in the refrigerator for at least 3 hours. 2. To cook the salmon, heat a skillet to medium with a little olive oil. Place each fillet in the olive oil and then flip it and move it from the center. This will make sure each piece has some olive oil on it. Season the pieces with salt and pepper and press in with the spatula. Flip the pieces after 3 minutes or so and repeat with the seasoning. Cook until the fish flakes and the internal temperature is at least 145F. 3. Serve the salmon over brown rice and top with the salsa. Enjoy! 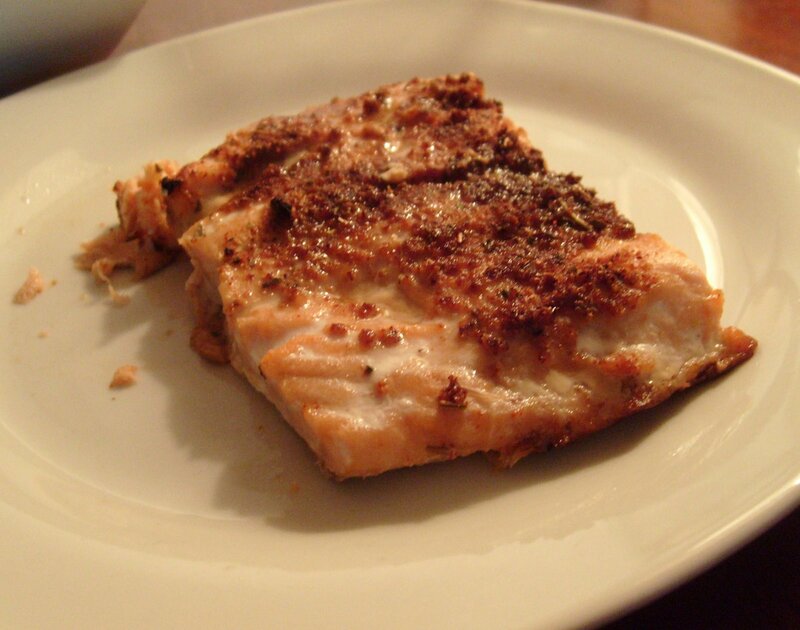 Another fish recipe – I have been going crazy with the seafood lately! This is a recipe I personally did not try – it looked like it would have too much of a fish taste. However, Jason reassured me it was quite good. This is probably one of the easiest recipes -if you can call it that- I have ever made. 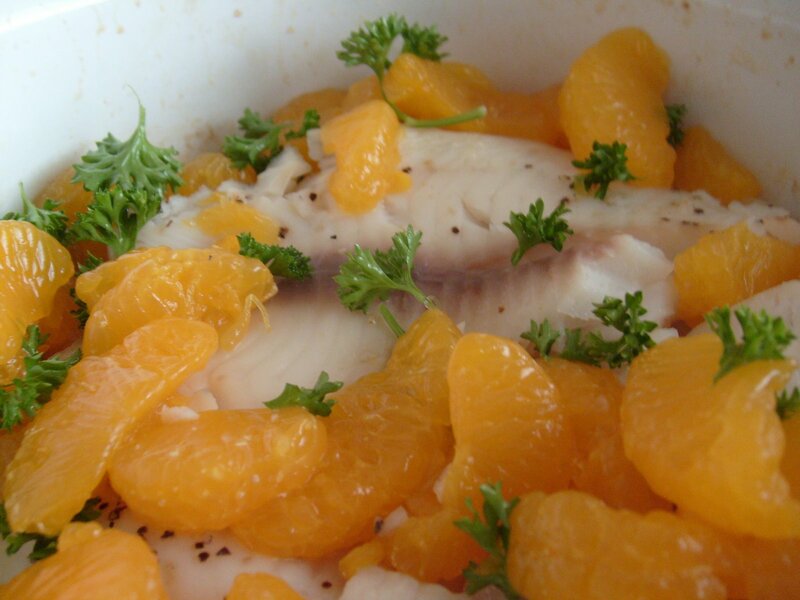 You roast the tilapia, open a can of mandarin oranges, rip up some parsley, and you’re done! Spray a corning wear dish with cooking spray. Place fish in the dish and sprinkle with 1/4 tsp salt and 1/4 tsp pepper. Drizzle with a tsp of oil. Bake fish at 400F for 14 minutes, or until fish flakes easily. If possible, check to make sure the temperature reads at lest 145F. If using fresh oranges, grate 3 tsp orange rind. Peel and section oranges over a bowl, reserving about 2 tbsp juice. Chop sections. Combine rind, oranges, parsley, 5 tsp oil, and 1/4 tsp salt into a bowl and set aside. Combine 2 tbsp reserved juice, 1/4 tsp pepper, 1/4 tsp salt, and 2 tbsp parsley with brown rice and mix well. Serve fish with salsa on top and rice on the side. Combine all of the ingredients except the fish and spray into a small dish and mix well. Spray a baking dish with cooking spray. On a plate, lay the fish flat. Pour some of the spice mixture on each fish and rub it into the fish. Reserve some spice mixture for the other side of the fish. Place the fish spice-side down into the pan. Pour the remaining mixture onto each fish and rub in. If you prefer, you can cover the fish after step 3 and let sit for a few hours in the refrigerator (obviously do not preheat the broiler then). Jason loves tuna and as most of you could guess by recent blog posts, I do not. The recipes I usually make (Cheesy Tuna Casserole) seems a little heavy, so I wanted to make something lighter for Jason. This recipe does use a slurry for the white sauce instead of a roux and does not have any cheese in it. Jason said it was just as good as they cheesy casserole, so I think it is a winner. Pour ½ cup of milk into a measuring cup and add 1 tbsp flour. Mix well. Add the remaining ½ cup milk and mix well. Add pepper, salad supreme, and rosemary. Pour mixture into a pan and stir constantly over medium heat with a spatula until it begins to bubble. Remove from heat and stir in Parmesan cheese. Pour Parmesan cream sauce over the veggies and mix well. Add the cooked and drained noodles to the mixture. Stir completely. If desired, you could pour into a casserole dish, top with bread crumbs, and bake at 375 for 15 minutes, or until bread crumbs are browned. While I worked at Ruby Tuesday, Crab Cakes were a very popular item. Seaweed is probably the only water-originating item I ever eat, unless I am forcing myself to eat some fish. Jason, on the other had, love all fish, but has a shellfish allergy, so he has been been able to try crab cakes. 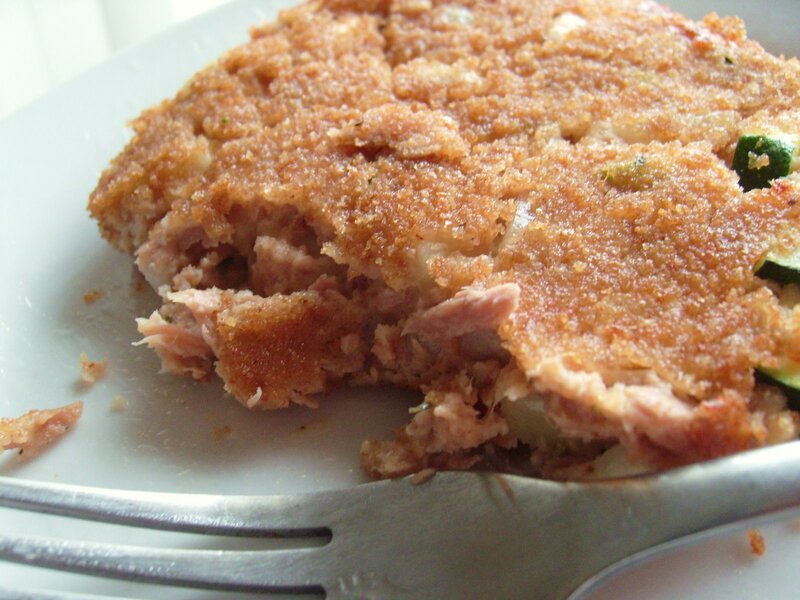 Flipping through my favorite new Cooking Light cookbook, I found a recipe for Tuna Cakes. The version I made is much different, because I did not have most of the ingredients on hand. The cakes themselves were a hit. The only thing that was a little disappointing was that not all of the cakes easily stayed together. I still have yet to master the “perfect patty” for any non-meat based patty. I am determined to try chickpea burgers in the near future. In a large bowl, mix all of the ingredients up to the oil together. Scoop out a large spoonful of mixture and pat it out on a plate or cutting board. Cover with bread crumbs and pat them in. Heat olive oil over medium heat in a skillet. With a spatula, carefully pick up the patty and flip it into the pan. With the spatula, make sure the patty is formed. Carefully pour bread crumbs on top and pat into the patty. Cook for 3 minutes on each side. While one patty is cooking, scoop out the next patty from the mixture and repeat the process. If you are skilled at this, you can do more than one patty at a time. Add more oil to the pan each time to prevent burning. Serve with a lemon cream sauce or tarter sauce. I hate to admit it, but I do not enjoy eating fish – at all. Growing up, I spent around 3 hours at the dinner table because I refused to finish my white fish (I do not even remember what it was now). However, the benefits of fish are innumerable, so I have begun weaning myself into it. They say it can take 10-20 times for you to adapt a taste for a food, so I have long ways to go. This recipe was suppose to contain pecans, but I did not have any, so instead I just omitted them. You could add any chopped nut. As I have said before, I have been slacking on picture taking, Because of this, I do not have a picture today. When I make this again, I will remember to take a picture and post it. If anyone reads this and makes this recipe, feel free to send me a picture and I would be happy to post it. Set 2 shallow bowls on the counter. In the first bowl on the left place the all purpose flour, in the middle blow place the buttermilk, and in the last bowl on the right place the bread crumbs, flax, salt, and pepper. Set a lightly greased baking dish next to the last bowl on the right – you now have your assembly line. Dip each fillet in the flour, then buttermilk, and lastly in the breadcrumbs. Place on the baking dish and repeat. Bake fish for 10 minutes at 375F. Depending on the thickness you may need more or less time. The fish is done when a thermometer reaches 155F. Since I don’t like fish very much, I always need a little something, so I made my own tarter sauce with Kraft Olive Oil Mayo, Relish, and Dijon Mustard. Just mix 2 parts of mayo with 1 part of relish and mustard. Add more of each to taste. Jason loves Tuna. I, on the other hand, have hated fish most of my life. After learning the nutritional benefits, I was on a mission to begin to like some fish. Currently, I do not mind Salmon and Tuna Steaks. I am still working on White Fish! As many of you probably know, fish is loaded with long chain omega 3 Fatty Acids (EPA and DHA). The long chain ones have most of the beneficial properties we hear about when we hear about omega 3 fats. The only way to get these long chain fatty acids is from fish (or fish supplements, such as fish oil) or human breast milk, which leaves us with fish. Flaxseed does contain omega 3 fatty acids, but the version is much shorter (think about it like the food chain. The fish eat the plant and the fish’s body takes the short chain fatty acid and makes it bigger). The shorter version, while still healthy and beneficial, does not come near to containing the benefits that fish contain. You may be thinking, “while, if fish can make a longer chain, why can’t we?” This is a longer, more complicated story. I will try to summarize…our bodies have enzymes that make fatty acid chains longer. However, all fats use the same enzymes, so whatever fat is most predominant in our bodies will get to use more of the enzymes. Sadly, omega 3 fatty acids are the least consumed fat in all of our diets, so it is very difficult for our bodies to find the resources to elongate all of the short chain omega 3 we consume to long chain omega 3. The simple solution…eat more fish!! Thaw fish, if frozen. Rinse fish; pat dry with paper towels. Place fish in a shallow dish and coat with teriyaki sauce; add just enough so some drips down the sides and coats the salmon. Place in the refrigerator for 30 minutes. Once ready, grill Tuna steaks to 145F, flipping once. Serve with rice. 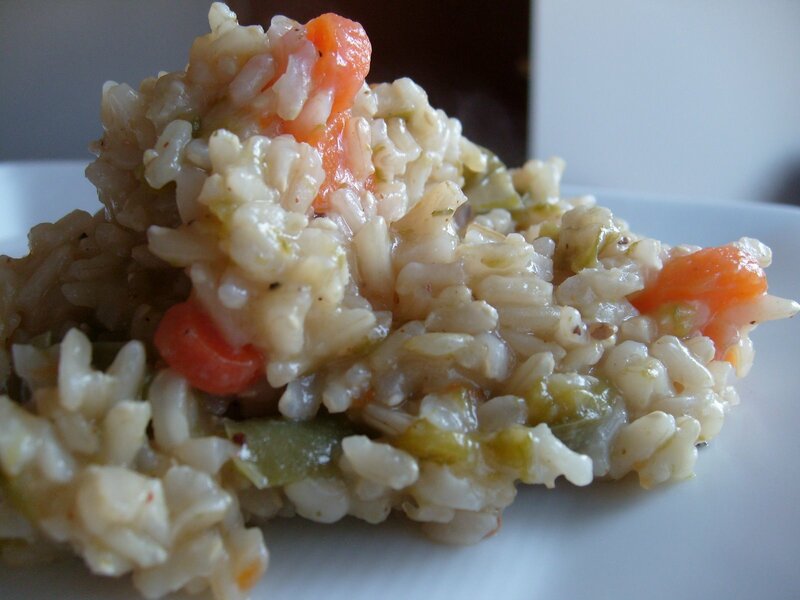 In a 2-quart saucepan combine water, rice, carrot, onion and pepper. Bring to boiling. Reduce heat and simmer covered for 30 minutes. Stir in seasonings. Cook, covered for 5 – 10 minutes more or until rice is tender. Remove from heat. Let stand covered for 5 minutes. Stir in teriyaki mixture, if desired. p.s. I did eat the entire meal with chopsticks (which I got from my sweet friend Whitney). It was a long process, but I did it. Talk about a natural way to control how fast you eat! There is so much buzz about Omega 3, I figured I would post something on it. I learned a lot about this in my undergrad, so I do not have a specific source to cite; however, if you would like a source that backs up what I am writing, let me know and I will find one for you ASAP! The form of Omega 3 that has shown to be the most beneficial, the long chain version (EPA and DHA), is only found in fish. While the plant form (found in flax seed) is beneficial, it is only the short chain version and it is difficult for our bodies to convert it to this long chain version. Because of this, there have been increased recommendations for fish consumption; fatty fish in particular. If you want to learn more about DHA, the American Dietetic Association (ADA) has published a fact sheet on it that can be found at this web address: http://www.eatright.org/ada/files/Martek_Fact_Sheet.pdf. Jason loves fish and I am learning to like it as well, so I have been experimenting with different dishes. One of Jason’s favorite classic dishes is Cheesy Tuna Noodle Casserole. 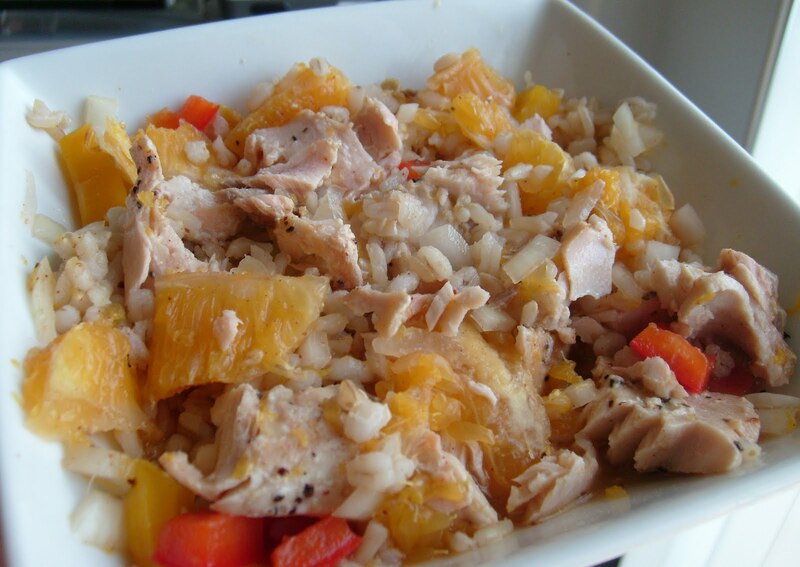 While I have tried to like tuna, I am not there yet, so I personally did not try this dish. However, Jason ate the entire casserole in 4 sittings, so I am pretty sure it was a hit! While this dish is a little higher in calories, pairing a resonable portion size with a side salad will provide adequate nutrients without overdoing the calories (I would reccomend getting 6-8 servings from this casserole dish). Cook noodles according to the directions on the package; drain noodles and pour into a greased, 1.5 quart casserole dish. For the sauce, you will make a traditional white sauce: melt the butter in the pan and cook onions. Add flour and any desired seasonings (salt, pepper, Italian, etc…). Once the fat and starch are completely Incorporated, remove from heat and slowly add the milk, continuously stirring to preventing lumps from forming. Once incorporated, return to heat and stir to thicken for 1-3 minutes. This is a traditional white sauce (you could use this for Alfredo or any cream sauce you may like to make; just add the necessary seasonings). Turn off heat and add cheese; stir until fully incorporated (now you have a traditional cheese sauce…great for dipping chips in!). Add peas and tuna to the sauce and stir until evenly distributed. Add the sauce to the noodles and mix completely. Top with bread crumbs and any additional seasoning desired. Bake 30-35 minutes, or until bread crumbs are a light golden brown and the center is fully heated. Let stand 5 minutes before serving. *original recipe derived from bhg.com (with multiple alterations).